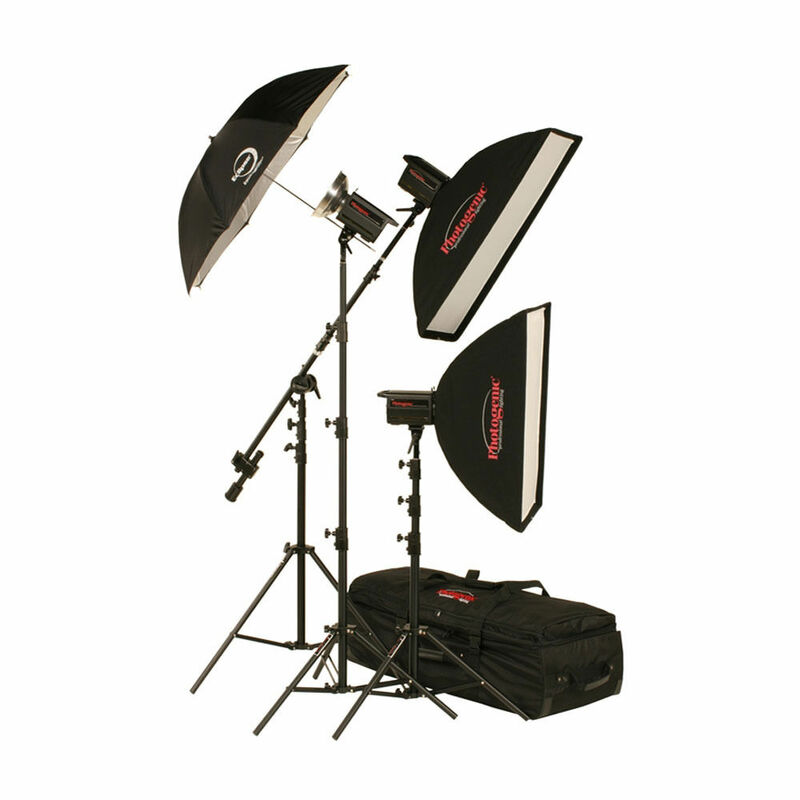 The Photogenic 1,500W/s Solair 3 Light Studio Kit with PocketWizard (120V) is a great way to achieve studio-quality lighting in-house or on location. The heart of the kit is the Solair monolight. Building on the foundation of the popular PowerLight series, the enhanced Solair has an 8 stop extended power range selectable in 1/2 or 1/10 stop increments with repeat flash accuracy within 1/20 of a stop. All of the power settings are displayed on the large, digital LED screen. The bright 250W modeling lamp can be set to full, on/off, user preference or proportionate to the flash power. What distinguishes the Solair however, is Constant Color Technology. It's quite common for other brands' color temperature to vary wildly when dropping from full to minimum power. The Solair varies a mere 100K from full to 1/128 power; indiscernible to most people. Another unique feature is the Flash Auto Bracketing function. Under and over power settings can be programmed into the flash head in 1/10 - 1 ½ f/stop increments around the prime or normal exposure. Of course, they're great for product work or portraiture as well and Photogenic has you covered on both counts. Both 24 x 32" and 12 x 36" softboxes are included in the kit. The first is an ideal source for head and shoulders portraits and the 12 x 36" box is an excellent sidelight or product light which yields long elegant highlights on reflective objects. There's also a 45" umbrella to use as a fill light for 3-point lighting. Two 8.0' light stands are provided, as well as 1 heavy duty 13' stand which is perfect for the included boom arm with counterweight. Use the scoop-type backlight reflector on one of your lights to create sophisticated effects behind your subject. It all fits in a soft-sided wheeled carrying case. The Photogenic Solair PL500DRC 500W/s Monolight offers speed, power and control, a wide choice of accessories and intuitive operation backed by impressive specs at a very reasonable price. The PL500DRC keeps you fully informed of your power levels via its large highly readable digital display. Power settings are adjustable in 1/10 or ½ stop increments across an impressive 8 full stops. The bright 250W modeling light can be set to Proportional to let you previsualize your final shot when using multiple lights. Other settings include Full On, OFF and manual control of the modeling light output. The PL500DRC Radio Solair even allows 2 or 3 shot bracketing around your prime exposure. The PL500DRC recycles to full power in a lightning-fast 1.5 seconds at full power and 0.5 seconds at minimum power with short flash durations that help you stop every gesture, an attribute which is extremely valuable when working with kinetic subjects like dancers or athletes. Convenience features include a test button, optical slave and integral handle.The UV color corrected flash tube ensures that blue doesn't creep into your color balance on subjects like a bride in her gown. It also ensures natural, flattering skin tones. The PL500DRC comes with a 7.5" reflector and is compatible with a wide range of optional accessories including grids, snoots, parabolic reflectors, softboxes and umbrellas. This 7.5" high gain reflector fits all Photogenic Powerlight and StudioMax II monolights. It gathers and intensifies the light output of the flash head. It can be used with any umbrella, and all Photogenic Powerlight accessories, such as barndoors, grid holders and filter holders. The standard, clear, UV Coated flashtube for the Photogenic PL2 Series monolights. The Photogenic ESS 250W Modeling Lamp is a replacement modeling lamp for Powerlights PL1000, PL500, PL2500, PL1250, PL300, PL1500, PL1875. This is a plastic protective cap for storage and transport of the Photogenic Powerlight monolights. This is a replacement 110V grounded AC power cord for all current Photogenic PL Series monolights and Photomaster power packs. Compatible with: Photogenic, Profoto, Speedotron, Hensel, SP Excalbur, and others. The 24 x 32" Rectangular Softbox with Back Plate and Mounting Ring for Photogenic Flash Heads provides soft, yet intense light for your subjects. The interior is silver, for a little extra snap to the light. The spring tension rods fit easily into the softbox and into the included Photogenic speed ring. The front panel is touch-fastener fitted, allowing you to place the panel at the edge or 1.5" into the box for improved light direction. Suggested use: 1 or 2 person half-length portrait. This is the medium strip, 12 x 36" size Softbox with Quick Change Adapter for Flash from Photogenic, which is suitable for a side-accent light or hairlight for group of 2 people when mounted on a Photogenic flash head. Photogenic softboxes are designed to enable photographers to illuminate a subject evenly over a specified area. Different geometry softboxes are available to meet specific needs of photographers. Photogenic offers two square and two rectangular softboxes to choose from. The recessed front helps prevent lens flare from excess light spill. For added stability when using a PL2500DR, you can remove the stand adapter bracket on the bottom of the PowerLight and move the stand adapter to the holes at the rear of the stand adapter bracket. This Photogenic EC45BC Eclipse 45" White Flat-Panel Umbrella with its removable black cover has an extra white satin panel added during construction. The result is the elimination of the reflection of the metal frame of the umbrella in the eyes of your subject, or on highly reflective surfaces, such as chrome or brass. This size is perfect for portraits of 1 or 2 people, and small product set ups. This umbrella is designed for use with strobe lighting. Note: Using this umbrella with modeling lights or constant lights brighter than 300 watts for prolonged sessions will result in eventual discoloration or scorching. Softens and broadens the light output of any strobe or lower wattage constant light. Removable black cover allows the light source to "shoot-through", as a more direct light. Note:Ribs are hidden in bounce mode. Removing black cover for shoot-through exposes the ribs. The ability to shape and control the light from a flash source is essential. This is one of many different reflectors available for the Photogenic line of flash heads and monolights. It is used for lighting a background evenly, and softly. The Photogenic Air Cushioned Light Stand rises to a maximum height of 8'. It has four sections, which enables it to fold down shorter than a three section stand. It folds to 26". This is a black-finished, 13' Talon Air-Cushioned Stand from Photogenic. The Talon line of light stands from Photogenic are a combination of design quality and practicality, achieving superior stability and longer service life even under constant, rigorous use. Optional casters are available for added convenience. Photogenic Telescopic Boom Arm with counterweight and swivel bracket for 1/2" stand top. Two sections. Expands from 5' to 6.5'. Box Dimensions (LxWxH) 15.0 x 12.0 x 10.0"
Box Dimensions (LxWxH) 8.5 x 8.5 x 8.4"
Box Dimensions (LxWxH) 5.55 x 3.1 x 3.05"
Box Dimensions (LxWxH) 3.45 x 1.15 x 1.15"
Box Dimensions (LxWxH) 5.433 x 5.354 x 5.276"
Box Dimensions (LxWxH) 9.75 x 9.75 x 2.65"
Box Dimensions (LxWxH) 5.5 x 2.5 x 1.5"
Box Dimensions (LxWxH) 30.0 x 7.8 x 4.8"
Box Dimensions (LxWxH) 29.0 x 7.0 x 4.5"
Box Dimensions (LxWxH) 29.5 x 2.4 x 0.6"
Box Dimensions (LxWxH) 8.4 x 6.6 x 4.75"
Box Dimensions (LxWxH) 24.0 x 5.0 x 4.5"
Box Dimensions (LxWxH) 45.5 x 5.5 x 4.4"
Box Dimensions (LxWxH) 36.3 x 6.7 x 6.4"